Storing cigars is a scientific process designed to maintain their freshness and flavour so you can enjoy them whenever you like. If you don’t store them correctly they can soon degrade and become far less enjoyable. In general, home storage requires a humidor. A humidor maintains a consistent humidity for the cigars to replicate the environment the tobacco was grown in. Here in the UK, our humidity is far lower than in the tropics where the cigars are rolled and we must therefore simulate it. A humidor is simply a box that raises the level of humidity inside above that of the environment, and maintains it. They can be small boxes, all the way up to huge wardrobe-sized devices holding hundreds of cigars. As well as a practical necessity, they’re often used as a statement of status or fashion – many are ornately carved from rare hardwoods and have highly complex humidifying systems. When it comes down to it, though, they all do the same thing – maintaining a cigar-friendly humidity. With insufficient humidity a cigar will smoke too dry, too hot, or too unevenly. Too much moisture and they can be difficult to draw, or even get moldy. Humidors have to be air tight and contain a humidifying element filled with distilled water (tap water can contain contaminants that cause the cigars to go moldy or damage the humidifying element). Large humidors tend to have industrial humidifiers, whereas smaller ones have a simple tray carrying an absorbent object like a sponge. That absorbent object is soaked with water, and naturally releases that water into the humidor’s atmosphere. In the UK they tend not to need to be heated or cooled because homes tend to maintain a temperature approximately correct for cigar storage. You just need to be sure you don’t store them next to a heating element or A/C unit. To get a new humidor going you need to first add a cup of distilled water and close the lid. You should then wait 24-48 hours before adding cigars to about half capacity. Check these every day for freshness, and slowly start to fill the humidor while keeping an eye on the humidity and the freshness of the cigars. It’s worth checking your humidor on a daily basis if you can. When you check it you need to use a hygrometer to do this – most humidors do come with them. You should also inspect your cigars regularly. Lightly pinch them to ensure that they have not hardened or softened – they should have a slight spring to them and should not deform too easily. You should also look for any signs of damage to the wrapper or bulging in the filler – the cigar should maintain a fairly uniform thickness. And of course, you should keep your eye out for mold. When traveling taking a full humidor can be a bit too difficult or unwieldy. It’s therefore necessary to have a travel case to take your sticks on the road with you. This is our area of expertise. We’ve already written a blog discussing what makes a good travel cigar case so check that out here. Our own Hemingway Edition leather travel case is designed to keep cigars fresh by utlising the natural humidity-maintaining properties of cedar wood. The exterior of the case is made from quality, robust leather – perfect to withstand the rigours of travel. 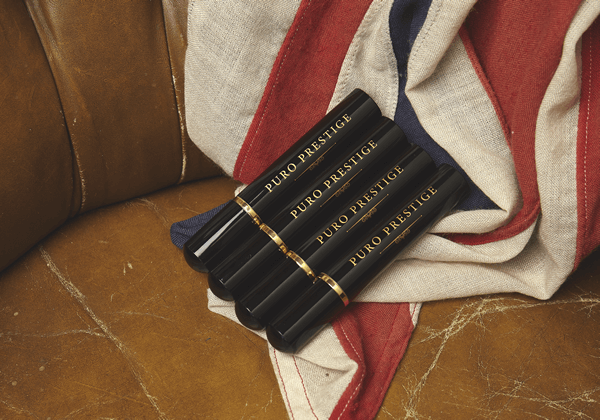 It’s had some excellent reviews so if you’re looking for a way to take your cigars with you, look no further.